Gerald (Gerry) Feltus was born in 1943 at Streaky Bay, a small country town on the 'West Coast' of South Australia. In 1956 he attended Sacred Heart College at Somerton Park as a boarder. One day, during a walk along Somerton Beach, a position near a sea wall was pointed out to him and a discussion revealed that this was where the body of an unknown man was found in 1948. The seeds of a life long interest had been planted. In 1964 he joined the SA Police Force and after a short posting in the industrial city of Whyalla he joined the Criminal Investigation Branch (CIB). He there met the original detectives investigating the suspicious death of the unknown man and followed the continuous media exposure that generated considerable public interest in the unanswered questions that were being raised. In 1975 he was transferred to the Major Crime Squad (MCS) where the file on the unidentified man was maintained and monitored. He transferred from the MCS in 1979 and performed CIB duties in a number of other sections, returning to the MCS as a team leader in 1992. Along with the investigations of a number of other notable murders, he also inherited on a 'watching brief' basis the unidentified man inquiry. He realised that the media and public maintained an intense interest in the subject and he consistently received inquiries and information requiring attention. He received the Australian Police Medal (APM) in 1998, and retired from the police in 2004. Throughout the period since 1948, the subject has captured and held the interest of a number of generations throughout Australia. Unfortunately, many people have only had access to limited and sometimes fragmented information that has hampered their theories and speculations. 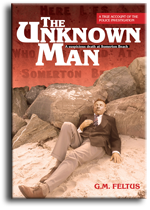 Recognising a need to compile a true account of the investigation, Feltus has produced this book titled 'The Unknown Man' (A suspicious death at Somerton Beach) to assist those searching for the missing pieces to the puzzle.